Last time in our turntable restoration project, we cleaned up the cadmiumplated linkages, then refurbished the main bearing and the idler wheel bearings, but there’s still some vital work to be done on the motor itself. To gain access, the motor must be removed from the chassis – and the process begins with disconnecting the mains cable and desoldering the switch suppressor wires from the connection box on the side of the motor. The speed-change linkage also has to be disconnected from its control knob. Six springs suspend the motor from a frame that is held to the chassis by three screws. With these removed, the frame detaches from the chassis. Each spring hooks onto a pin, which is secured by circlips. These circlips are removed, allowing the pins to be pushed out. Now the freed motor can be worked on. By undoing two nuts on the bottom of the motor, the outer casing splits in half. Each half contains felt oil-retaining washers and sintered bushings for the motor spindle. To ensure correct running, these parts of the motor need lubricating, but only the top bushing is accessible without dismantling the motor. Even dismantled, access to the bottom bushing remains limited and the bottom metal plate must be removed by drilling out the rivets. 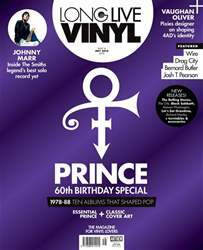 Issue 16 of Long Live Vinyl hits the shelves on what would have been Prince's 60th birthday. Our cover story focuses on the astonishingly prolific decade between 1978-88, when the Purple One released 10 albums that shaped the future of pop. We also round up the 40 essential Prince releases on vinyl that your collection should not be without and profile the cover art that accompanied his remarkable catalogue. Elsewhere this issue, we speak to The Smiths legend Johnny Marr about how he made his best solo album yet – Call The Comet – in his home city of Manchester, hear how Josh T Pearson raised the bar with his own latest record, and sit down for a chat with post-punk icons Wire. In our packed features section, we find out which record changed everything for former Suede guitarist Bernard Butler and meet famous 4AD artist in residence Vaughan Oliver to talk through his classic designs for the Pixies, The Breeders and Cocteau Twins. Also this month, we turn the spotlight on a label that's become a Chicago institution with a mind-bogglingly diverse roster – Drag City, Mark Elliott travels to Belfast for his latest cratedigging adventure in The Trip, and we take an in-depth look at the making of Carole King's career highlight, Tapestry. If all that's not enough, our packed reviews section rounds up new releases and reissues by The Rolling Stones, Black Sabbath, The Orb, Kamasi Washington, Let's Eat Grandma, Richard Hawley and many more, plus you'll find expert hardware buying and HIFI DIY advice, as well as turntable, speaker and accessory reviews. Long Live Vinyl is THE magazine for vinyl lovers. Pick up your copy today!